Seaforde swimmer Bethany Firth came away from the British International Para-swimming meeting in Glasgow with an incredible four gold medals, six world records and six personal bests. 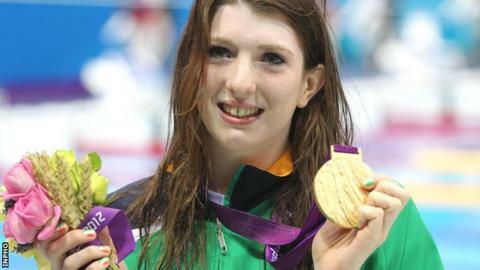 The Paralympic gold medallist, who will compete for Great Britain from August this year, won the 200m freestyle, 100m backstroke, 100m breaststroke and 200m Individual Medley events. Firth completed her quadruple success by securing victory in the S14 200m Freestyle in a world best time of 2:06.93 to give her 1097 points. She won the 100m breaststroke with a time of 1:18.25 in the heats and 1:17.07 in the finals, both personal bests. The 17-year-old smashed the world record for the 200 IM in her heat in 2:27.27, then got another world record in the finals with 2:24.89. In Sunday's 100m backstroke heats, she recorded a time of 1:06.69, bettering that in the finals with 1:06.00. Today she had the 200 free which yet again she managed to obtain the gold & 2 world records with 2.08.15 in the heats & 2.05.93 in the finals. In the 200 metres freestyle, she again managed a gold and two world records with 2:08.15 in the heats and 2:05.93 in the finals. Firth won the 100m backstroke at the London Games in 2012.